Most Americans have no connection Memorial Day, their heritage or to the legacy left behind by those who gave their lives in service to this country. 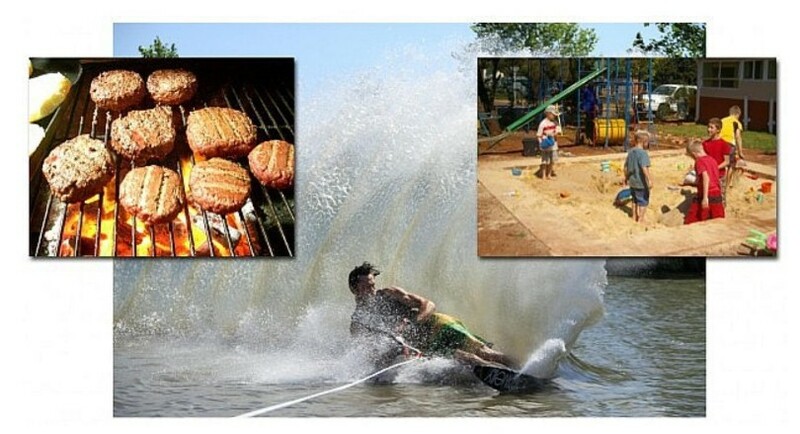 This weekend, we Americans are being inundated with myriad auditory treats, such as the sound of burgers and hot dogs sizzling on the barbecue grill, the roar of the ski boats tearing across the lake, the rapid-clicking of fishing reels spinning, or the din of children playing in the backyard. All of this points to the commencement of summer and the excitement-filled season of outdoor activities, vacations and fun. The bonus is that we get to extend this weekend by a day and play a little harder as that’s what this weekend is all about! With the opening volleys of artillery (the Confederates firing on Fort Sumter) in the early morning hours of Friday, April 12, 1861, a war of the bloodiest nature commenced within the confines of what was known as the United States of America, but which was anything but united. The division of the states had been years in the making as the founding fathers could hardly agree on the slavery issue when trying to establish a single Constitution that would bind the individual states together as one unified nation. The division led to an all-out conflict—a war that would pit brother against brother and father against son—that wouldn’t cease until almost exactly four years later (at Appomattox on April 10, 1865) and three-quarters of a million Americans were dead (the number was recently revised, up from 618,000, by demographic historians). 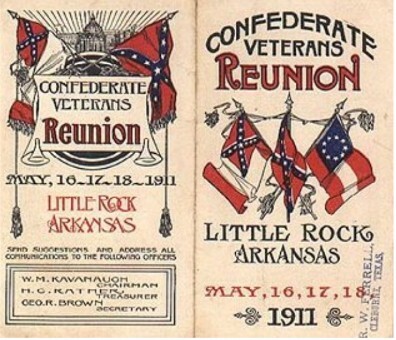 A 1911 reunion pamphlet for the United Confederate Veterans organization. In the days, weeks, months and years that followed, the sting of the Civil War would linger as families suffered the loss of generations of men. The Southern States where battles took place had cities that were obliterated. The agricultural Industry was devastated. The business operation surrounding the king crop of the south, cotton, heavily dependent upon slave labor, had to be completely revamped. Many plantations never returned to operation. The Northern industries that had grown extremely profitable and dependent upon the war, churning out uniforms, accouterments, artillery pieces and ammunition, no longer had a customer. Although the South was undergoing reconstruction and the nation was moving to put the war in the past, and some Americans who lost everything were seeking to start afresh in the West. Like the servicemen and women of the current conflicts, Union and Confederate veterans alike were dealing with the same lingering effects of the combat trauma they had endured. While life for them was moving on, they were drawn to their comrades-in-arms seeking the friendship they shared while in uniform. In 1866, Union veterans began reuniting, forming a long-standing veterans organization (which would last until 1956 when the last veteran died) that would be known as the Grand Army of the Republic (GAR). Similarly, Confederate troops would reunite, but wouldn’t formally organize until 1889 with the United Confederate Veterans. While the country was still engaged in the war, the spouses and mothers of troops, along with their local communities, honored those killed in the war—the scant few that were returned home for burial—by decorating their graves. Freed slaves (known as Freedmen) from Charleston, South Carolina, knew of a tragedy that took place at a prisoner of war (POW) camp where there were more than 250 Union soldiers who had died in captivity and had been buried in unmarked graves. The Freedmen, knowing about the graves, organized and gathered at the burial site to beautify the grounds in recognition of the sacrifices made by the soldiers on their behalf. On May 1, 1865, nearly 10,000 Freedmen, Union veterans, school children and missionaries and black ministers, gathered to honor the dead at the site on what would come to be recognized as the first Memorial Day. Gettysburg Reunion: GAR members and veterans of The Battle of Gettysburg encamped at the gathering (source: Smithsonian Institute). To mark the 50th anniversary of the Civil War this group of Confederate veterans reenacted “Pickett’s Charge” at Gettysburg during the 1913 reunion (source: Smithsonian Institute). The largest gathering of Civil War veterans took place in 1913 at the Gettysburg battlefield, marking the 50th anniversary of this monumental battle. Soldiers from all of the participating units converged on the various sites to recount their actions, conduct reenactments, and to simply reconnect with their comrades. Heavily documented by photographers and newsmen alike, the gathering gave twentieth century Americans a glimpse into the past and the personal aspects of the battles and the lifelong impact they had on these men. By the 1930s, the aged veterans numbers had dwindled considerably yet they still continued to reunite. In one of these last gatherings, Confederate veterans recreated their battle cry, the Rebel Yell, for in this short film (digitized by the Smithsonian Institute). 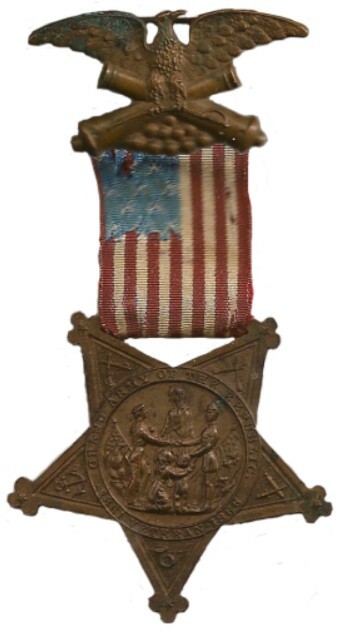 Obverse and reverse of a GAR medal from 1886 (source: OMSA database). This vintage cabinet photo shows a Civil War veteran proudly displaying his GAR medal. GAR Membership medals are very collectible and are reasonably priced. While collecting Civil War militaria can be quite an expensive venture, items related to these veterans organizations and reunions are a great alternative. One item that is particularly interesting, the GAR membership medal, was authorized for veterans to wear on military uniforms by Congressional action. The medals or badges were used to indicate membership within the organization or to commemorate one of its annual reunions or gatherings. Over the years following the 1913 reunion, veterans and their families increasingly honored those killed during the war around the same time each year. As early as 1882, the day to honor the Civil War dead (traditionally, May 30) was also known as Memorial Day. 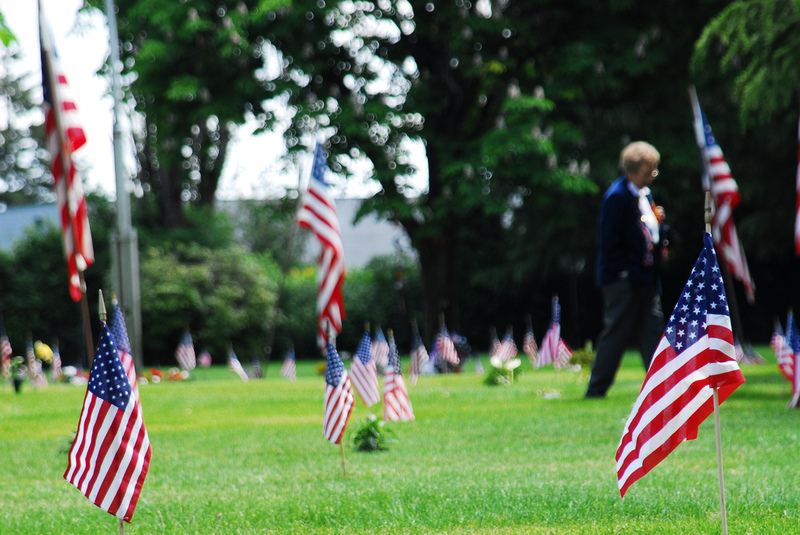 After gaining popularity in the years following World War II, Memorial Day became official as congress passed a law in 1967, recognizing Memorial Day as a federal holiday. The following year, on June 28, the holiday was moved to the last Monday of May, creating a three-day weekend. 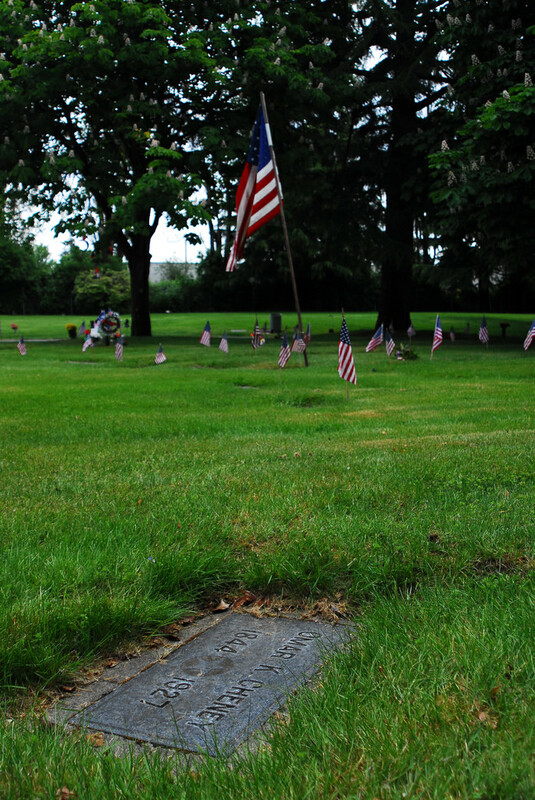 A woman walks the cemetery grounds on Memorial Day. The grave of Union Veteran and GAR member, Omar Cheney. This Memorial Day, rather than committing the day to squeezing in one last waterskiing pass on the lake or grilling up a slab of ribs, head out to a cemetery (preferably a National Cemetery if you are in close enough proximity) and decorate a veteran’s grave with a flag and spend time in reflection of the price paid by all service members who laid down their lives for this nation. Note the stark contrast to the violence experienced on the field of battle as you take in the stillness and quiet peace of the surroundings, observing the gentleness of the billowing flags. The hunt. The search. The quest for the prize. Seeking and finding the “Holy Grail.” We collectors tend to describe the pursuit of those elusive pieces that would fill a glaring void in our collection with some rather lofty terms or phrases. We wear our collection objectives on our sleeves while pouring through every online auction listing, or burning through countless gallons of gasoline while making the rounds from one garage or yard sale to the next. Antiques store owners (whom we think are our friends) have our lists of objectives to be on the lookout for. 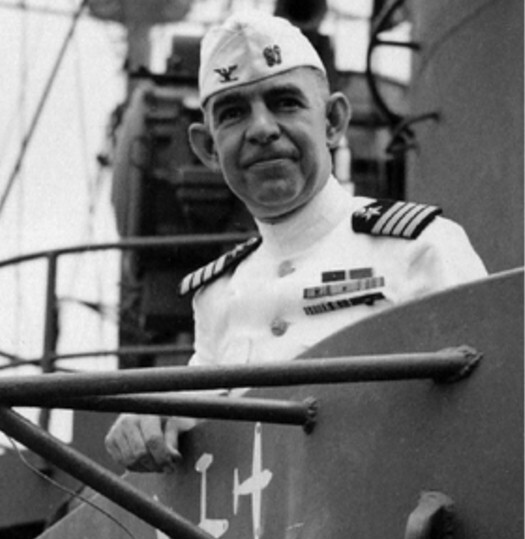 A close-up of the USS Astoria’s first commanding officer, Captain George C. Dyer, wearing his choker whites and the rare white garrison cover (source: Brent Jones Collection). Militaria collectors (any collector, for that matter) thrive on the hunt and feed off the adrenaline rush that comes from achieving each victory as they locate and secure the piece that has seemingly evaded every search effort. Hearing that they’ve missed an opportunity by seconds due to some other collector beating them out only fuels their passion. Losing an auction because they tried to play conservatively with their bidding propels them through the twists, turns, hills and valleys of the emotional roller coaster. Searching for militaria can be an exhausting endeavor. For the last two years, I’ve been searching for a piece and while I can’t say that I’ve been through these scenarios, I did manage to feel an amount of elation when I achieved success with my objective. This shot shows Captain George C. Dyer departing the Astoria wearing his dress white uniform and the white garrison cover (source: Brent Jones Collection). I’m not wanting to repeat myself (which I do quite often, considering all of my previous posts), but let me state that I do not consider myself any manner of expert on military history or militaria. I assert that I have a broad-based knowledge on a narrow scope of U.S. military history (20th century) with a primary focus on the U.S. Navy. So when I discovered an item that I had previously never knew existed, I was quite curious and subsequently needed to obtain it. An acquaintance (who had contributed photos for my first book that I published in 2009) has a website that is the public face of his extensive and invaluable research on the USS Astoria naval warships. 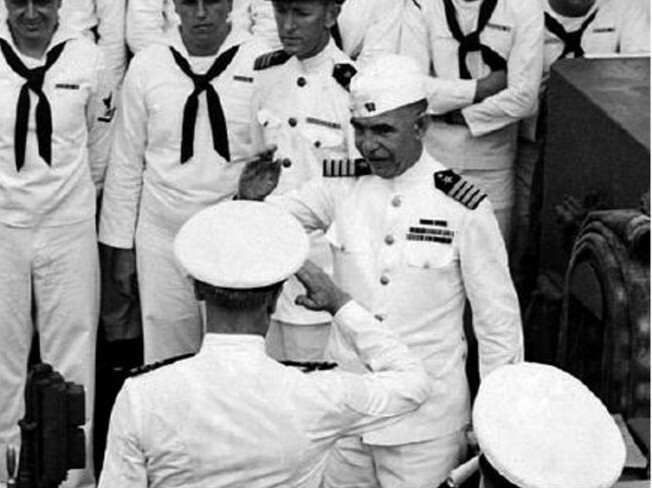 On this site, I noticed some new images that he had recently obtained and published showing the first commanding officer, Captain George C. Dyer, of the USS Astoria CL-90 turning over command of the ship and departing amidst his change of command ceremony. Pictured here with an early WWII chief radioman’s eight-button, dress white uniform jacket, the (yellowing and aged) white garrison cover is a bit more distinguishable from a khaki variant. For the ceremony, the ship’s crew is turned out in their summer white dress uniforms. All appeared to be normal until I spied the unusual uniform item – the commanding officer was wearing a garrison cover (hats in the Navy or Marine Corps are known as covers). Affectionately known as a (excuse the crass term) “piss cutter,” I knew that the garrison was available for use with the (aviator) green, khaki, (the short-lived) gray and the blue uniforms, but I had never seen a photo of this white variety. Garrison covers are not particularly stylish, but due to their lightweight and soft construction, they are considerably more comfortable than the traditional combination cover (visor caps) alternatives. 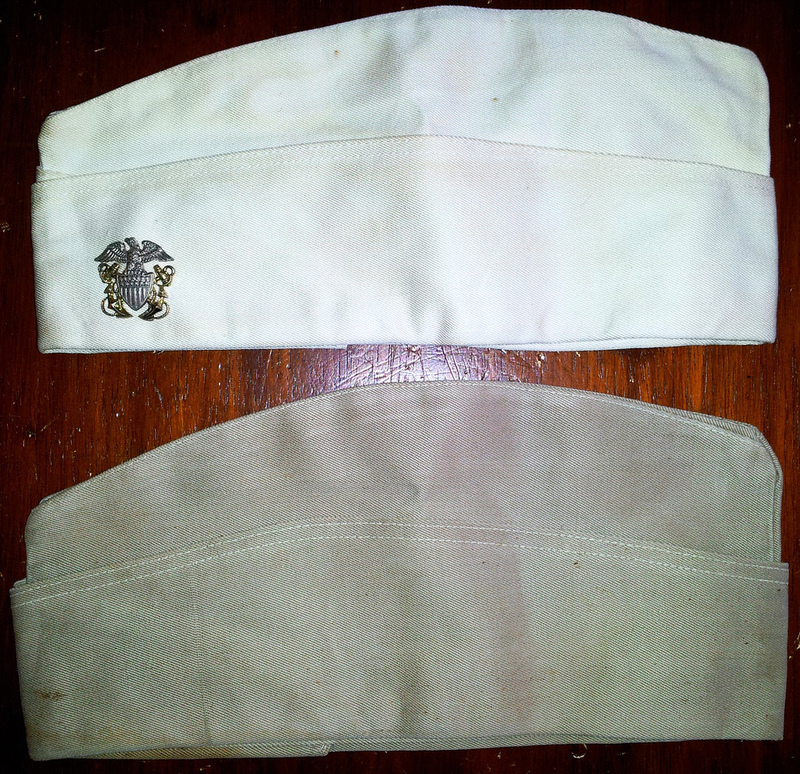 A Garrison Comparison: at the top is the white garrison (compared with a WWII khaki) demonstrating that, though it is yellowed, it is the rare white cap. Plentiful and very readily available, the khaki versions are quite frequently listed or for sale at antiques stores and garage sales. The green, gray and blue garrisons are a little bit more rare yet turn up with some regularity. The white garrison is the great, white whale. Considering that it was not well-liked in the fleet during the war (when it was issued), it is now extremely rare for collectors seeking to possess all of the uniform options. 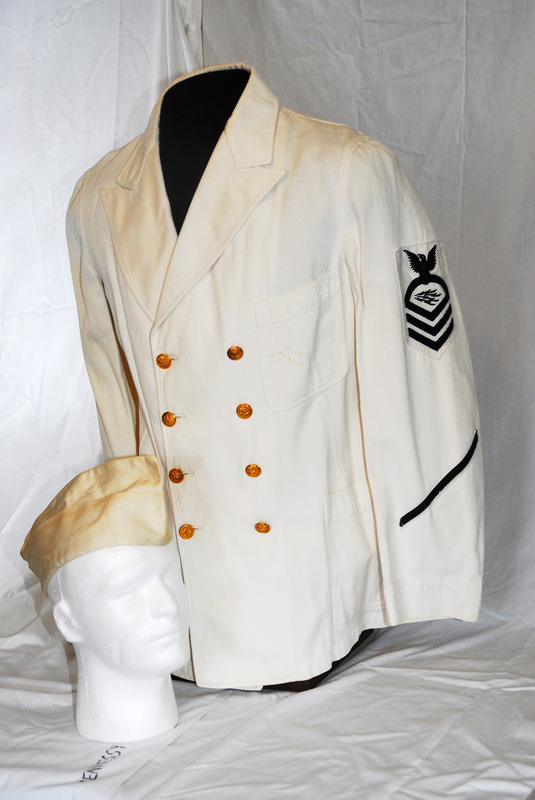 The white garrison is truly the white whale among World War II navy uniform items. 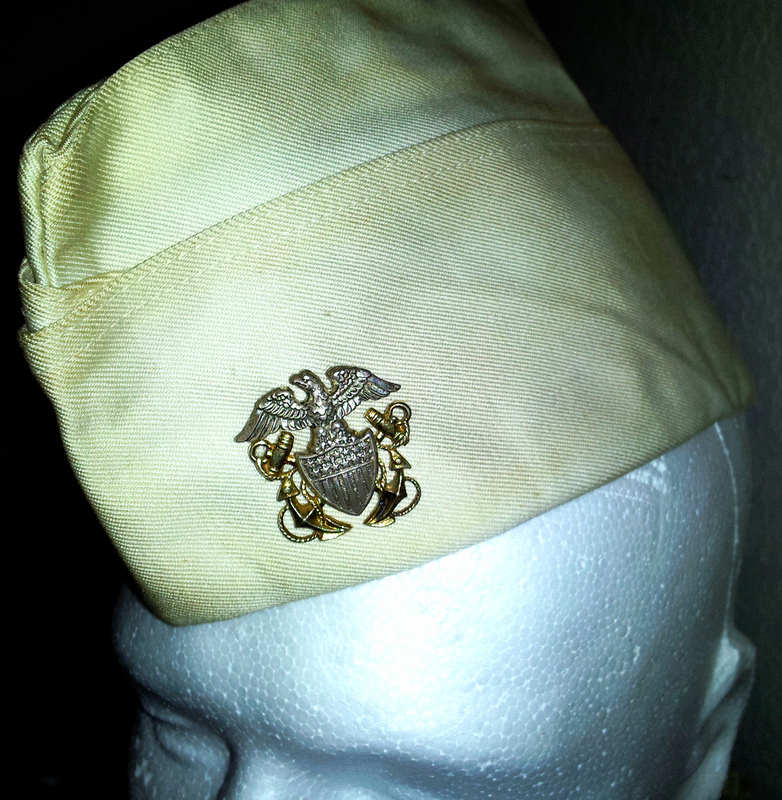 I added the vintage garrison cap officer’s crest device to the white garrison cap. Seeing this hat in the photos fueled my quest to obtain one for my collection. The very first one I had ever seen listed anywhere became available last week at auction. I placed my bid at the very last second and was awarded with the holy grail. Yesterday, the package arrived and was both elated and saddened as my quest was fulfilled. No longer needing to hunt for this cover, I feel as though I have lost my way… a ship underway without steerage. What am I saying? I have plenty of collecting goals un-achieved!